Nothing finer than making your own burgers. You get to choose your own flavours, how much chilli you want to add in, the meat you want to use – and given the range of stuff that’s become available in my local butchers it could be anything from Buffalo to Zebra! Anyway, this is a great one for getting your hands dirty. Squidging the mix between your fingers is very, very satisfying. and it makes the kids happy! Meat. About half a kilo of whatever meat you like should make enough burgers for your average family. If you’re using lamb, then mint is essential. Breadcrumbs, about 1:5 with the meat, so 100g breadcrumbs for 500g meat. Philadelphia or similar brand of soft cheese. 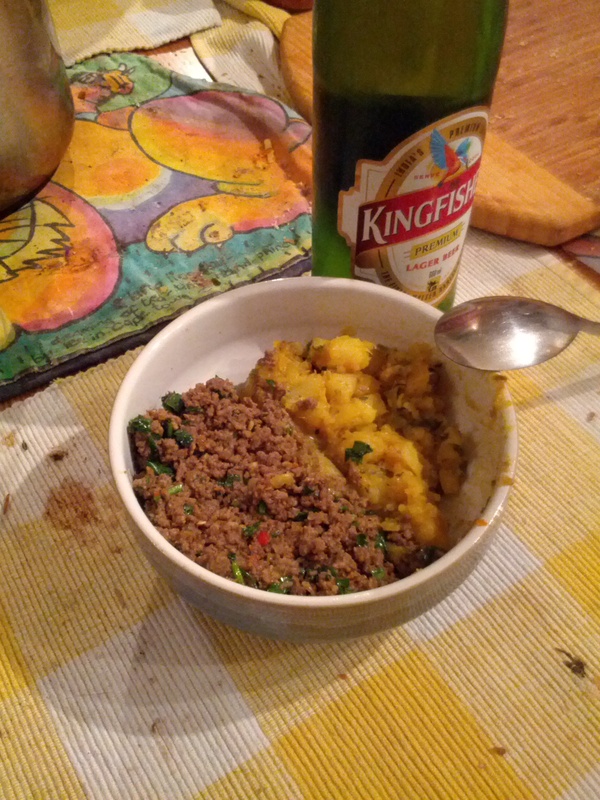 If it’s a coarse mince, blitz it a bit to make it finer. Mix everything except the Philadelphia evenly, really working everything together with your fingers (or your kid’s fingers). Treat it like Christmas cake and get everyone to get their (washed and clean) hands in and make a wish! Grab a handful a bit bigger than a golf ball and flatten it. Squeeze the edges together to make sure there are no gaps that the Philadelphia can ooze out of. It will happen while you’re cooking, but if you minimise the problem now you’ll save a lot of fuss. Dust with a little plain flour on both sides. My local butcher makes some excellent burgers, they roll the edges of lamb burgers in a mix of mint and chilli, the edges of pork burgers get breadcrumbed. Leave to chill for half an hour before cooking. Cook until done. This obviously depends on the size and thickness of your burgers. Turn them regularly while cooking to stop one side from burning too much. When the Philadelphia starts to ooze out (that’s when, not if), they’re pretty much done. When it’s starting to ooze, that means it’s hot right through to the centre. Serve with bread rolls and suitable condiments. My kids swear by tomato ketchup, I prefer a strong mustard or chilli sauce. If you’re a fan of unnecessary garden, serve with a salad of your choice. There’ll be one more Cookalong Friday next week, then I’m off for 2 weeks and you’ll be left to your own devices. Unless, of course, anyone’s wanting to step up to the plate and write me a guest recipe? Back on familiar ground this week, though with a twist. And, no. That twist isn’t a Royal Wedding-themed curry. To be honest, I’d be the man on the train into London wondering where everyone was going or on the M25 wondering why it was so quiet. I know there’s been blanket coverage on the TV but these things just don’t register on my radar! 4 onions, finely sliced. Whenever a recipe says this I put them through the Kenwood although I do now have a wonderful ceramic cleaver and I now know the meaning of “finely sliced”!!! Put everything from the lamb down to the chicken stock into a large pan. That’s it. Fire up the hob to a medium heat, bring everything to a simmer then drop the heat to low. Bang on a lid, leave it mostly alone for two hours (long enough to watch some of that Royal Wedding coverage!). Check on it from time to time, removing any oil that comes to the surface. Whack the lot in a slow cooker and ignore. Put it in the pressure cooker. Cook for half an hour with no pressure then 15-30 minutes at full pressure (your mileage may vary!). Sometimes this works wonderfully, sometimes the stuff sticks like dried-on Weetabix and burns. I’ve not worked out how to judge this one yet, I’m just starting on my pressure-cooker career. Add the rest of the ingredients (but not the sugar) along with a couple of tablespoons of the juice from the pan to a blender and blend until smooth. Stir this into the lamb mix, bring it back to a simmer, add the sugar, taste and adjust seasoning, serve. Cunning Tip Number 1 – You’re cooking for kids and adults and you want a full-heat version for the grown-ups. Split the contents of the main pan and the blender in two (or whatever the ratio of kids to adults is), stir the un-chillied blend into pan 1, add chillies and blend again before adding to pan 2 for a full-heat, feel-the-burn, toilet-paper-in-the-fridge adults mix. So there you go. Nothing particularly hard or scary about this one, fully adjustable heat levels so you can watch the looks of amazement on the other parent’s faces when you say “Oh, yes, my kids eat curry” as if it’s something perfectly normal and they’re the weird ones for not eating it! Personally, I love the fact that I don’t have to cook different meals for the adults and the kids. Works wonderfully well with all that fine spring lamb that’s frolicking in the fields at the moment and the fresh mint that’s sprouting in the garden. Enjoy and tell me all about it in the comments!